Nyt en morsom dag i solen på øya T'ing eventyr utenfor kysten av Key West. Seile vekk fra øya byen Key West til det vakre blå vannet i Mexicogolfen på en stor katamaran. Hopp i kajakk og nyt en padle rundt en naturlig stand av mangrove. Snorkle over et korallrev. Se etter delfiner, stingrays, havskildpadder, manater og mer på dette guidede 6-timers eventyret. En full frokost og lunsjbuffé, samt øl, vin, brus og hjemmelaget sangria er inkludert. Hold deg opptatt med en full frokost og lunsjbuffé! Tilbring en dag utenfor kysten av Key West, i det blå vannet i Mexicogolfen, på Island T'ing eventyr. Begynn med en 1-timers seil gjennom det glitrende vannet i Florida Keys, der Atlanterhavet møter Mexicogolfen. Se etter dyreliv som delfiner, stingrays, havskildpadder, manater og mer sammen med båten. Nyt en frokost med quiche, muffins, frisk frukt og juice. Så er det tid til litt moro i solen. Etter å ha funnet et flott sted i Florida Reef, delta på en valgfri 1-timers kajakk tur rundt en naturlig mangrove øy. Gled over det varme, tropiske vannet og nyt de unike plantene, det marine livet og fuglene som bor i dette området. Prøv deretter en 1-timers snorkling økt over et korallrev, det eneste levende korallbarriereivet i det kontinentale USA. Se mer enn 600 arter av fargerik fisk, korall og annet sjøliv. Ellers ta en forfriskende dukkert i det krystallblå vannet eller slapp av på båten og nyt solen og naturen. En buffet lunsj inkludert stekt kylling, dampet reker og smørbrød med forskjellige salater er inkludert. Øl, vin, brus og hjemmelaget sangria er også inkludert. Få en følelse av eventyr, pluss et badedrakt, håndkle, solbriller, solkrem og en lue. The crew was friendly and accommodating. They were so helpful with less experienced passengers so all could enjoy snorkeling and kayaking. Meals and snacks were plentiful, especially lunch. Would highly recommend this tour! Safety - poor display of safety by the crew for people on a boat especially with kids. The life jacket/device given to snorklers was less than adequate. The kayaking trip also was a safety issue. Kayakers were sent off on rough waters with no life jackets. You had to ask for it or in some cases people were discouraged from going kayaking. Food was served at the most inopportune time with the boat swaying back and forth. Safety issue for most people on the boat. It should have been served when the boat stopped ..half hour later. The value of the trip vs the cost of the day was not worth it. Captain Brett and Mate Nick provided a fun day in the sun with everything you could possibly want. Besides setting up for our reef snorkeling followed by our informative guided kayaking trip around the mangroves, we were treated with an unlimited delicious breakfast, lunch, beverages and snacks. Just as advertised!! An EXCELLENT ADVENTURE!! My wife and I and the other couple we were vacationing with had the pleasure of joining Captain Tim, Nick, Sam, and Trevor for an amazing day out on the water. This day trip 10a-4p was probably the highlight our visit to the Keys. The staff were attentive, friendly, and showed us a great time. Also, the food was delicious and our beer glasses were always kept full. An added bonus was that a couple of the staff are originally from New England like us! RHODY RHODY RHODY!!! I'd highly recommend this trip FYI run by Sebago tours for folks of all age groups if it helps to know my wife and I are in our mid-20s. Again, another shout out to Tim/Nick/Sam/Trevor for providing a great experience for us! Happy sailing! We had a wonderful day! The Cat was well kept, food was great, staff was friendly. I would recommend this trip. Myself, husband, 26 year old son as well as his girl friend all had a blast. Great excursion! Excellent food and fun. The service was exceptional and Jake and Tim were great! Perfect getaway for the day. I was extremely disappointed with the trip. 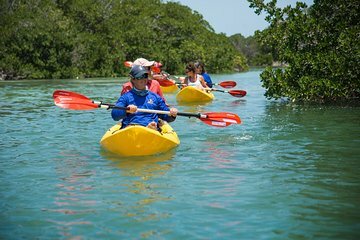 We first took a kayak ride around a small island with mangroves. We were told we might see turtles, dolphins, manta rays, etc. We saw nothing but birds. Next we were taken to a site where we could snorkel and see a coral reef and marine life. The captain told us to swim towards an island and we would see everything there. The majority of us swam out in that direction, but saw nothing. The captain pointed us in the wrong direction. I have been snorkeling in Cancun, Belize, Barbados and this was the absolute worst trip to date. The captain's assistant was great, but we didn't see anything that would make the trip worthwhile. I spent over 336. for my wife and daughter and we might as well have stayed on shore. Beautiful, a day to remember! Would do it again.